Social Security is going broke - again. There are 2 main reasons: 1) the ratio of worker to recipient is constantly narrowing, and 2) there is increasing fraud in the system. 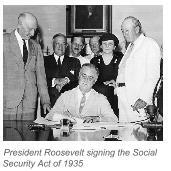 • Raise the income limit for social security tax from $106,800 to $140,000. • Put a portion of social security money into low risk investments, such as Savings Bonds or Savings Account at a bank.